Many Western New Yorkers who have been diagnosed with high blood pressure are taking steps to ensure the improvement of their health. Thousands, however, are ignoring advice given to them by their physicians and continue to put their health at risk according to a recent report from Univera Healthcare. Adopting a healthier lifestyle goes a long way in managing the damaging effects of high blood pressure, the report from Universa said. This includes keeping a close eye on weight, exercising, eating a proper diet and listening to doctor's advice. "About two out of three of the 416,000 Western New York adults diagnosed with high blood pressure said they changed their diet or increased their physical activity to manage their condition," said Richard Vienne, D.O., vice president and chief medical officer at Univera Healthcare. "But one in three Western New York adults with the condition is not taking these two crucial steps to improve blood pressure control. "That's concerning, because properly managing high blood pressure can add years to your life and help you avoid costly crippling health problems, such as heart attacks, strokes and kidney disease," he added. Of the adults diagnosed with high blood pressure, 66.2 percent to 70 percent said they changed their diet, reduced sodium intake and increased physical activity, the report found. A third said they do not drink but 10.1 percent said they had at least one binge-drinking episode in the 30 days preceding the survey. Four out of five said they take blood pressure medicine as advised by their doctor and 16 percent reported that they are currently smokers. Obesity remains the biggest predictor of high blood pressure. In Western New York 36.7 percent of adults diagnosed with high blood pressure were obese and 35.4 percent were overweight. One fourth of those adults were at what is considered a healthy weight, the report said. Blood pressure measures how hard flowing blood pushes on the inside of your arteries. 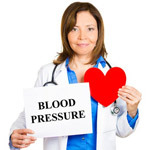 High blood pressure can damage blood vessels causing heart and kidney disorders. One is considered to have high blood pressure if the systolic pressure (top number) is 140 mm Hg or higher or if the diastolic pressure (bottom number) is 90 mm Hg or higher. "The report also found that a health professional's advice to adopt healthier behaviors can be a powerful motivator for patients," Vienne said. "About 75 percent of upstate New York adults diagnosed with high blood pressure who reported adopting a healthier diet, for example, said they were advised by a health professional to do so."